While Craig was gone these past nine days, I found myself watching a lot of True Blood on HBO Go. I’m still finishing up Season One, so no spoilers please, but I found myself quite choked up at a moment that was a subtle one, as far as the series goes. Sookie, the protagonist, is mourning the loss of a relative (see, I’m not spoiling it either) who–before dying–made a pecan pie, half of which remains in the refrigerator. At the wake, Sookie freaks out when someone tries to remove it; at the end of the episode, she eats the pecan pie and cries. What got me was this notion that through our food we live on even after our death. The ingredients that we use are merely objects, but how we combine those objects–with our touch, our sense of taste–is a manifestation of our spirit. It’s also true of the recipes we leave behind. 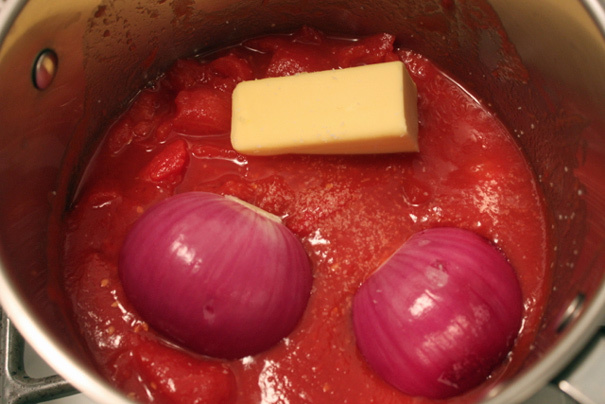 And so, in the real world, we mourned the loss of Italian cooking legend Marcella Hazan this weekend and last night I could think of no greater tribute than to make her celebrated tomato sauce with butter–a sauce that every home cook should know. The recipe went viral, though, because it’s just so good. 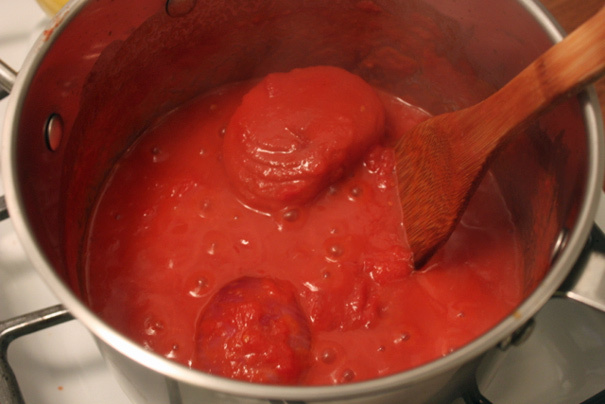 You can memorize it right here and go home and make it tonight: in a pot, place a can of tomatoes and cut them up with a knife (just drag it through the pot). Add 5 tablespoons butter, 1 medium onion (peeled and cut in half; I had a red one, though yellow would be better) and a pinch of salt. Turn up the heat, bring it to a simmer, and cook–gently–for 45 minutes “until the fat floats free from the tomato.” Stir now and then and, towards the end, taste for salt. Your whole apartment will smell like a combination of an Italian grandmother’s kitchen and a pastry shop (that’s the tomatoes and butter marrying together). At the end, you remove the onion, cook up a pound of pasta in salted water (Marcella recommends spaghetti, penne or rigatoni) and toss it all together with the sauce. (I lifted the al dente pasta with a spider into the sauce pot, turned up the heat and cooked for 30 seconds until the pasta was thoroughly coated). 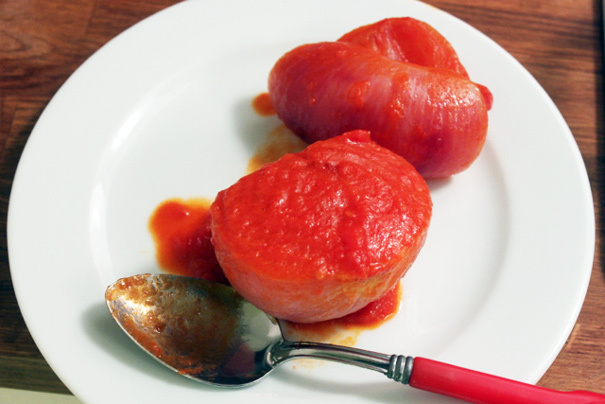 It’s a sauce that’s ridiculously simple to prepare and astonishingly delicious to eat. When Craig took a bite, he positively swooned: “It has so much flavor!” he declared. It’s the sweetness of the butter, the tartness of the tomatoes, and that little pinch of salt that makes the recipe so winning. 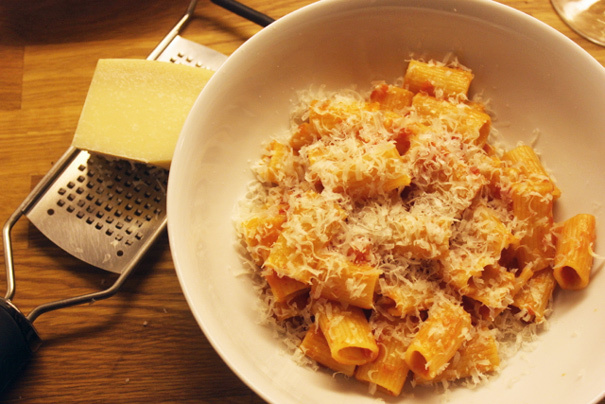 And with Parmesan cheese grated on top, you can do no better for an easy weeknight meal. In fact, I urge you all to find someone in your life who doesn’t cook and to send them this recipe. Chances are, if they take the trouble to make it, they’ll be a cooking convert. Credit Marcella. If you haven’t already, read Kim Severson’s very thorough account of Marcella Hazan’s life; then read Ruth Reichl’s lovely reminiscence. 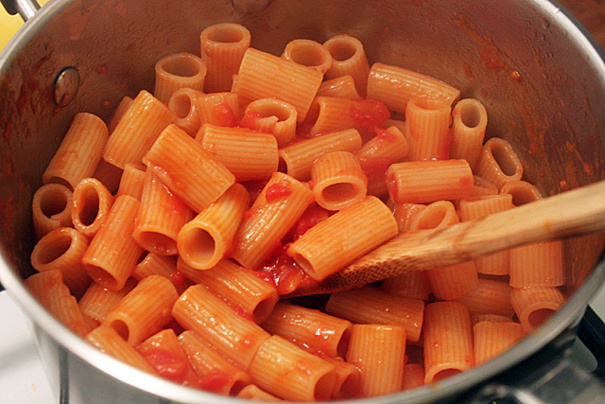 Mostly, though, you should make this tomato sauce. In your kitchen, at your stove, with just a can of tomatoes and a little more than half a stick of butter, you can bring Marcella back to life. The recipes we leave behind are powerful things. Summary: From Essentials of Classic Italian Cooking.